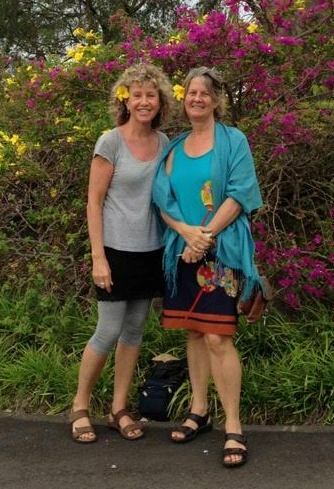 Sally Ann and Georgie Heathcote, Mauritius, 2016. “I took one year off after college before going to university (now quite normal & called a gap year I believe) in order to travel & work abroad. … and just never stopped, nor even went to university but went into tourism, worked in various places around the world, worked for five years as a travel guide/rep where I met my husband. We planned to return to GB to settle down but landed up in Switzerland where we currently still live with our three kids (who are now slowly flying the nest). I work as an English teacher her & incredibly nowadays feel more at home in Switzerland than in England. In my free time, when I’m not rushing around (which I often tend to do a bit too much) I regularly enjoy going power walking, regardless of the weather 2 to 3 times a week, which often astounds the Swiss! When time allows I much enjoy doing many creative things including photography also reading. In winter I love skiing, in spring gardening, in summer swimming and being outside as much as possible, naturally enjoying all the good weather we get here, and in the autumn I love walking in the beautiful Swiss mountains. But travelling is my greatest passion especially backpacking in and around all Asia. I’m happily still in contact with Nicola Mills (Talman), Geoff Grimes, Georgie Heathcote (Rey) who I visited earlier this year in Mauritius, Katie Heathcote (Cann), & David Bowsher. I also recently got in contact with Tim Bartlett & I’m presently trying to get in contact with Shona Nichols too. Sally has sent us a fascinating selection of photographs taken in 1977-78. These are being added to a new gallery. 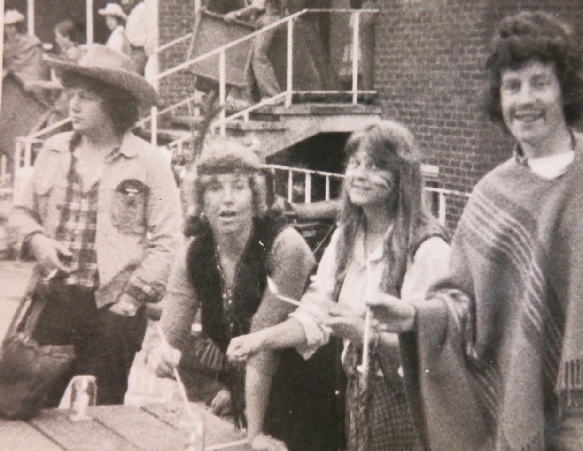 After the 400 Fete: Mike Ball, Sally Ann, Georgie Heathcote and David Bowsher.